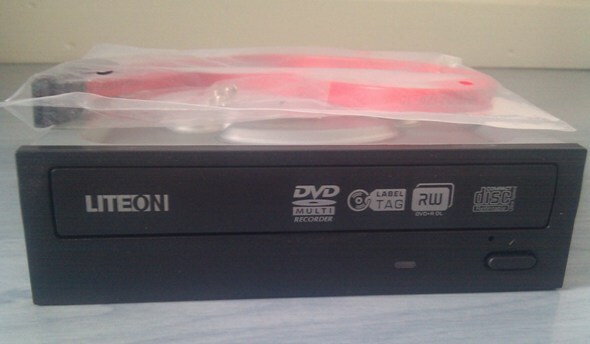 LiteOn were kind enough to send us one of their internal DVD-RW drives, the iHAS524, to review. In an extremely saturated market, it’s difficult to make such a product stand out, but the LiteOn iHAS524 comes with LabelTag technology, which promises extra functionality over standard drives. In the box, you’ll find the drive, alongside a SATA power and data connection cable, a Nero Essentials installation DVD and all the necessary screws to make sure that you can mount it in your PC without any problems. The Lite-On iHAS524 is a full sized 3.5” drive, so it won’t be able to fit in many small-form-factor PC’s such as those used as a media centre PC, although I mounted it in my tower PC without any issues. The bundled Nero software proved more than capable of allowing me to burn my media and files on to various DVD’s. The Nero package which was bundled also allows you to use the LabelTag features of the drive (more on that later on!). I found the performance of the drive to be great, with CD-R writing speeds of 48X and DVD+/-R writing speeds of 24X. The performance is definitely up with the best drives in the market, and Lite-On’s drive outperformed many of my other SATA drives that I have around, when both reading and writing. As well as offering consistently good read/write speeds, the iHAS524 includes two features that help it to stand out from the rest of the competition in the market. The first of these features is the ‘SmartErase’ feature, which allows you to either quickly erase, or fully erase the data on a disc. I tested the feature with a host of re-writable discs, and it worked perfectly every time, without any errors. Likewise, LabelTag, the other stand out feature of the iHAS524, performed admirably, taking about 15 to 20 minutes to complete. The results were impressive, with the tag easily readable with the naked eye. If you’re in the market for a new desktop DVD-RW drive, then you should consider the Lite-On iHAS524 as a strong contender. You can get one of your own for around £25 from an abundance of retailers.